Side one is an undated universal schedule, ruled with 22 lines plus note space. Side two is an undated vacation schedule with space for 25 employees. Bright, white background and large, bold print for easy reading. Write-on/wipe-off laminated surface erases with a damp cloth. Package includes black wet-erase marker and mounting hardware. 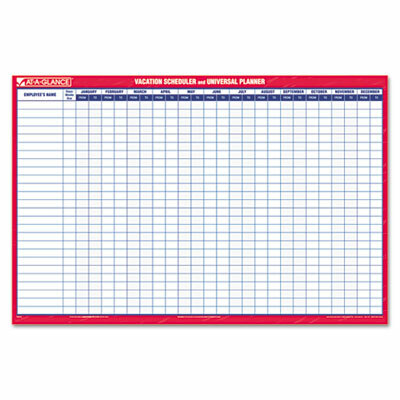 Track and make changes to planned vacations or time-off for the whole group with this erasable wall calendar. Reversible design features one side displaying a vacation schedule with 12 months and space for 25 employees, and another side ruled with 22 rows plus space for notes. Bold, large print and bright white background allows for easier viewing and reading. Write-on/wipe-off laminated surface erases with a damp cloth. Package includes black wet-erase marker and mounting hardware.